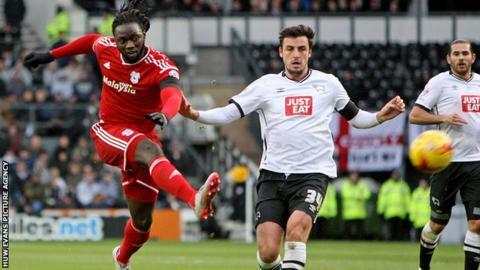 Manager Russell Slade has rued Cardiff City's lack of forward options following their 2-0 defeat at Derby County in the Championship. Cardiff, who have scored only 17 league goals in 17 games so far this term, had two shots on target at Hillsborough. Slade says he is close to signing a striker before the emergency loan window closes on Wednesday. "We were a bit limited in terms of our options with one or two injuries," Slade said. "I used all the options possible by bringing Sammy [Ameobi] on and young Matt Kennedy on in the end. "I'm hoping it [a loan] will be sealed before Wednesday." Cardiff faced Derby without injured duo Aron Gunnarsson and Anthony Pilkington, but Slade hopes they will be back in contention to face Burnley next Saturday. Second-half goals from George Thorne and Andreas Weimann secured victory for Derby County, who moved up to fourth in the table. Despite defeat, Cardiff are only three points off the play-off places in ninth and Slade could not fault his team's efforts against Paul Clement's side. "In terms of our attitude and work ethic we kept going forward and had a couple of opportunities," Slade added. "I thought we competed with them really well and created a few chances in the first half, all be it Derby had the lion's share of play. "Sometimes you've got to put your hands up and we were beaten by, in the end, the better side."